Doctors have a new weapon in the fight against cancer: detailed maps of the cells in a tumor that can be explored and analyzed in a virtual reality simulation that its creators say provides researchers with an intuitive new way to examine complex medical data that could lead to unexpected breakthroughs. Built by doctors at the Cancer Research UK Cambridge Institute (CRUK), the new virtual lab takes detailed scans of breast cancer tissues and turns them into detailed simulations that doctors around the world can explore, the BBC reports. 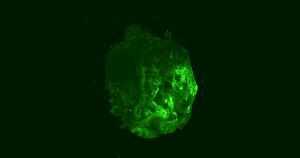 The simulation lets doctors analyze every single cell of a tumor, something they’ve never been able to do before. And because that data is stored in a simulation rather than microscope slides, doctors around the world can explore and study the cancer without having to prepare their own samples. The Cambridge scientists and peers from around the world who helped develop the virtual lab won two separate 20 million pound grants ($25.3 million each) to build up their project from Cancer Research UK last year. Now they have a functional simulation built up from highly-detailed scans of a cubic millimeter-sized sample of breast cancer tissue. In that sample, each of the roughly 100,000 cells was marked to highlight its molecular and genetic characteristics. With that information, the resulting VR map highlights which cells are cancerous which have certain genetic variations, and how developed the tumor was at the time of the biopsy. All of this is information that was laborious to obtain from samples that were easily contaminated. Moving the analysis to VR makes tumor research much more user friendly and lets doctors analyze cells in greater detail than ever before. Not only does that let scientists literally immerse themselves in their work as they look for new cancer treatments, but it can also open the door to more collaborative diagnosis and patient care among teams that are spread around the world. These simulations don’t guarantee that doctors will find new ways to treat or prevent breast cancer, but at least it makes the search much easier. The post Virtual Reality Tumors Could Help Lead to New Cancer Treatments appeared first on Futurism.